During the Independence Day holiday I decided I should write a post about my direct ancestor, Joseph Dawson, who fought in the Southern Campaign during the American Revolution. Along with his brothers, (William and Jonathan) and stepfather Jefferson Williams, they all served in the South Carolina Militia during the war. Joseph was born around 1748 in North Carolina. His father, Jonathan Dawson, had been lost at sea before he was born which left his mother Frances to raise him on her own. In all likelihood they lived on or near the Dawson Plantation along the Cape Fear River near what today is known as Averasboro. Frances later married Jonathan Dawson’s brother, William Dawson, and he was the only father Joseph had ever known. In 1761 William Dawson died and Frances married for a third time to Jefferson Williams when Joseph was about 14 years old. It’s hard to know what kind of person Jefferson was but among other things he was appointed as a Patroller in Cumberland County in 1763. Slave patrollers could be very rough individuals and often acted more like vigilantes than officials. I suspect that Jefferson was in the Militia (as patrollers often were) and the household was likely a less relaxed place than it had been before. There is certainly no record of how this might have affected Joseph but I do find it interesting that none of the Dawson sons (Joseph, William Jr. or Jonathan) ever named a child after Jefferson. The family only stayed in North Carolina for a few more years after that and by 1767 they had all departed for South Carolina and settled on land in the Old Ninety-six District. The backcountry of South Carolina was some of the furthest settled reaches of the southern frontier during this time. It was certainly not an easy place to live. This lawless state of this region eventually led to the Regulator movement during the late 1760’s. Because there was little or no official law enforcement in the backcountry the Regulators became a loosely organized group of vigilantes that acted as judge, jury and executioner when apprehending those accused of criminal behavior. Given that Jefferson Williams had recently been a patroller in North Carolina it is quite possible he became a Regulator after the family settled there. Joseph Dawson married Elizabeth Gibson in 1770 but it is unclear if they met in South Carolina or when they were both younger back on the Cape Fear. There was a Gibson family in Cumberland County and Thomas Gibson served as a Justice at the same time as William Dawson Sr. Even if this was part of the family the evidence points to a man named Patrick Gibson as Elizabeth’s father and I have been unable to find a record of him in Cumberland County and only in South Carolina. The first record of property purchased by Joseph was in 1771 for 100 acres on Stephenson’s Creek in what today is known as Abbeville. The location of this property is significant because only about a mile away from the land owned by Patrick Gibson and a smaller parcel owned by his brother (or son) Elias Gibson. It seems reasonable that Joseph and Elizabeth settled close to her relatives although I have never had much luck finding out much about her branch of the Gibson family. In 1772 Joseph and Elizabeth had their first child and named him William after Joseph’s father. In 1774 their second child was born and they named him Patrick Gibson Dawson. I don’t think it is a stretch to assume that this was after her father. Their son James Dawson was born next in 1775. During this time Joseph also sold what land he still owned in North Carolina. Not long after independence from England was declared, Joseph enlisted in the South Carolina Militia at the age of 29. This was in 1777, the same year his son Ezekiel Dawson (my GGG Grandfather) was born. During this first year he served as a Captain under Lt. Colonel Andrew Pickens in the Lower District Regiment. He is described as a “gallant soldier” in one account (1). When Joseph became a Captain it is interesting to note that officers in the Colonial Militia were actually elected by their men and that at this time older officers in the Back Country were often former Regulators. Joseph himself may have been a Regulator and was an officer of light Cavalry, also called Rangers. They weren’t true cavalry because they didn’t fight from horseback. 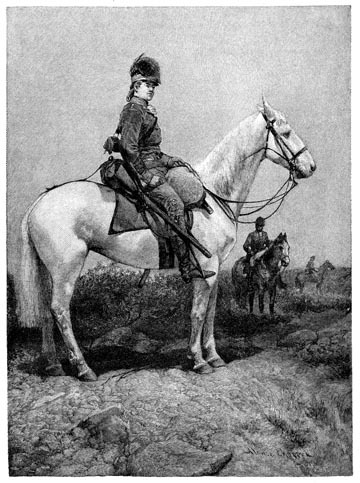 Instead the unit would ride to the site of battle but dismount to fight on foot. They were very mobile light infantry. In 1778 Joseph and his men were part of the forces sent on the Third Florida Expedition. Among those on expedition were also his stepfather Jefferson Williams, who had been a militia captain himself since 1776, and his brother William who Joseph recruited to serve as one of his Privates. They marched south through Georgia and into Eastern Florida during the summer of 1778 but after several skirmishes the colonial forces were defeated and they returned to South Carolina. Joseph continued to serve in the militia and he was wounded during the Battle of Cowpens in 1781. However, he appears to have fully recovered because he was again leading his men a few months later during the Siege of Ninety-six. He remained an officer in the militia until his forces were disbanded at the end of the war. After the Revolution he stayed in the Abbeville area until 1797 when he departed the region. He first headed for Williamson County, Tennessee and then later to Butts County, Georgia. I read somewhere that his wife Elizabeth died around 1797 and that was the impetus for his departure from South Carolina. I have also seen Joseph’s death listed as being in 1815 but this is almost certainly inaccurate. In 1832 there was a Joseph Dawson living in Butts County, Georgia who won land in the Cherokee Land Lottery. The Joseph Dawson recorded in those documents is listed as a veteran of the American Revolution. He would have been 84 years old at the time. As a last note I wanted to mention that the movie The Patriot takes place in South Carolina and many of the events in the film are based on the fighting that took place there during the American Revolution. Mel Gibson’s character Benjamin Martin is based primarily on General Francis Marion but also on a few others southern leaders including Colonel Andrew Pickens – the first commander Joseph served under in 1777. It’s not historically accurate but it does give a sense of the conflict and region where Joseph and his family lived during the American Revolution. (1) This is from the manuscript apparently written by Joseph W. Dawson in 1875. He was the son of Patrick Gibson Dawson. When thinking about William Dawson, his wife Frances, and their children (Joseph and William Jr., and Jonathan) this small personal library helps to reveal some of the thinking and discussions that probably occurred in their home. 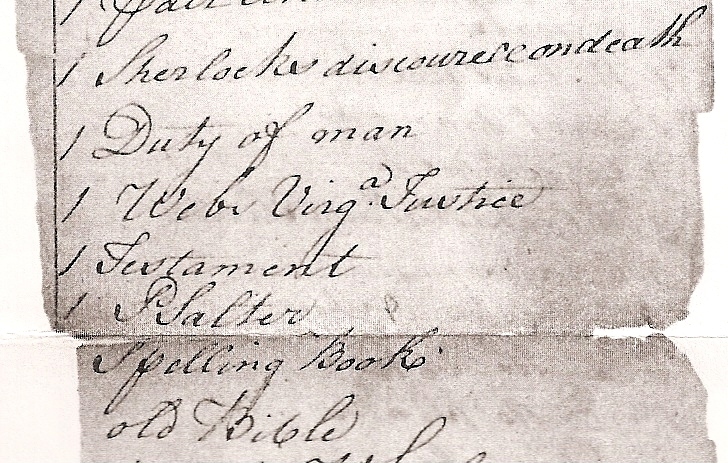 This list of books is from the estate inventory of William Dawson, Esquire, presented by his wife Frances Dawson to the Cumberland County Court during the August session of 1761. I am not an expert on personal libraries of the colonial period but these seven entries seem like a substantial collection for a family living on the frontier of North Carolina. This certainly suggests William Dawson had Arminian leanings if he wasn’t actively of that religious school of thought. Arminianism was a type of Baptist that opposed the predestination concepts of Calvinists. From what I have read the Arminian doctrine holds the individual is responsible for their own salvation. Some notable Colonial Arminians were: William Smith (father of Abigail Adams), Jonathan Mayhew, and Charles Chauncy. There was a strong Arminiain movement in the Colonies prior to the Revolution and it appears that William Dawson may have been part of it. Webb’s Virginia Justice was the next book. Written by George Webb, it was first published in the 1730’s and was a detailed manual on being a Justice of the Peace. As William Dawson served as a Cumberland County Justice it is not surprising that this was in his collection. The next book was only listed as a “Testament” and it was probably a New Testament printed in England as these weren’t printed in the Colonies until 1782. As he appears to have been actively interested in religious thinking it is not surprising he had this in his collection. A Psalter, or book of Psalms, was also listed. Edgar’s work mentioned that this was a common book in Colonial libraries in the south so like the Testament it is not surprising this was in his collection. At this point in the inventory there is a fraying of the paper so that the quantities of items below the previous entry were lost. This is unfortunate as the next item listed was only recorded as “Spelling Books”. There were certainly more than one but there is no way to know how many of these the Dawson family actually owned. I would guess though that it may have meant he had several of these spelling books. This leads me to think that William Dawson may have acted as a schoolmaster of sorts in his community. This is just speculation on my part as he was never listed as such on any documents. The last book is simply listed as an “Old Bible”. Of William’s books this is the one I would certainly love to see as it may have contained notes about the early history of his family. It is impossible to know if this Bible was lucky enough to have survived the last few hundred years and even if it did, where it ultimately ended up. The fact that he had both this book and a new testament suggests this “Old Bible” was not for everyday use. In all likelihood it was something of significance to him and may have been passed down from his father Geoffrey. Taken as a whole, William Dawson seems to have been a fairly progressive thinker. It also seems that he took his duties seriously as he kept books that corresponded to his roles as a Justice, Vestryman and perhaps that of a school teacher as well. I feel extremely fortunate that this document survived and that I had even this small window into what he may have thought and believed.